Meaning: Each new generation excels the previous. My name is Yana. My mother Yevgeniya and I were born in the city of Dnipro. My dad Wu Yupeng is a citizen of China. When I was 5 years old, my parents decided to move to China. We live in my father`s home city Xi’an which, interest- ingly enough, is Dnipro`s sister city. I am the only foreigner at school. Unfortunately, few people know anything about Ukraine. My mother and I do our best to answer every such question. We see this as our educational mission in China. In Ukraine, I have been studying Petrykivka painting style for 3 years. In China, I continue studying fi ne arts while attending Chinese painting classes. My family took part in two charity auctions to support large families of Ukrainian IDPs and foster families. Many Chinese and foreign nationals bought some of my paintings. We are very grateful for the assistance and support they provide to Ukraine in its most diffi cult time. My family hopes that we will return back home one day. We do not have too many dreams, but the main one is Peace in Ukraine! We believe that Ukrainians will build a modern European country which recognizes honor and dignity, justice and equality of all. As for the picture, it depicts the tradi- tional Chinese pergola. 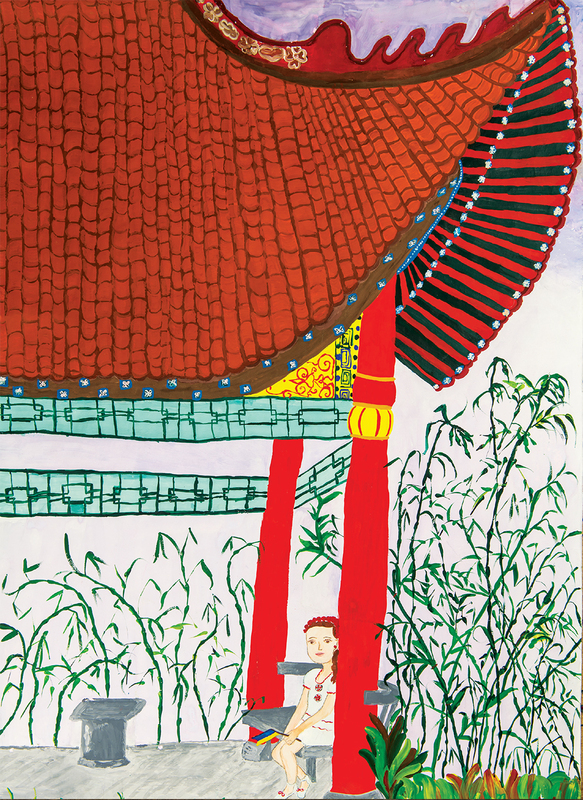 In this painting, I wanted to convey the inherent Chinese art of exceptional harmony of life of a person.